Findizer is a new application that is targeted at people who do shopping online. As the entire application is in French, there is no doubt that the developer has created it for French-speaking users only. At the time of writing, this piece of software is not very popular. Only 2722 users have installed it from the Chrome Web Store (chrome.google.com/webstore/detail/application-findizer/apbbnlboenllhnddfpokmeeiinhhhmmc?utm_source=chrome-app-launcher-info-dialog). Of course, some people have also downloaded it from findizer.fr, which is known to be its official website; however, we are still sure that it is not a very prevalent application. It is probably because it is targeted at a particular group of people, i.e. those who have a command of French. To be frank, it does not really matter where you live and what language you speak because you might still encounter Findizer. If this has already happened to you, you will have to remove this application from the system. We suggest doing so not without a reason. 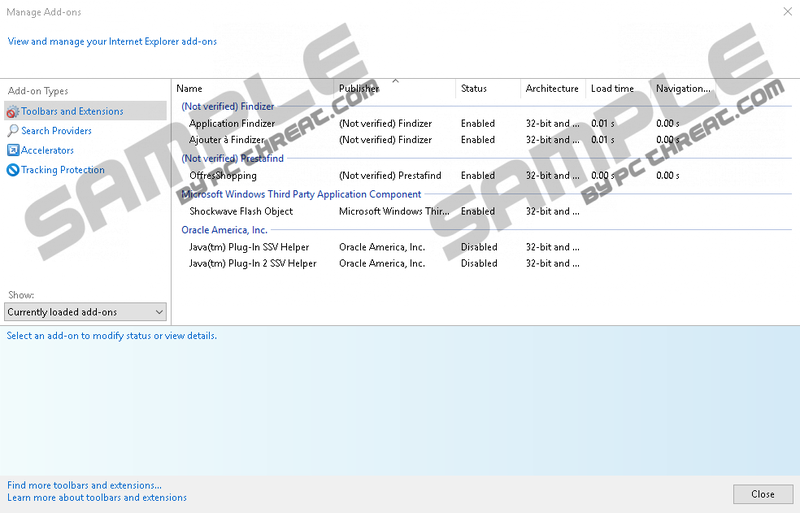 According to specialists at pcthreat.com, it is evident that Findizer is an ad-supported program (adware) even though the information available on its official website says that it will enable users to save particular products they like easily in order to find them later and will help to save some money by providing promotional codes and coupons. Findizer works on Internet Explorer, Google Chrome, and Mozilla Firefox browsers. Users usually get the Internet Explorer and Mozilla Firefox versions of this software from findizer.fr, whereas the version for Google Chrome can only be downloaded from the Chrome Web Store. It does not really matter which version you have because all of them act the same, i.e. you will start seeing various coupons, shopping suggestions, pop-ups, and other types of ads on your screen after the installation of Findizer because it is an advertising-supported application. You will notice quickly yourself that all these ads are really annoying. On top of that, there is a possibility that they will expose you to potential threats one day. For example, you might be taken to an untrustworthy website after clicking on any of the ads shown by Findizer because they promote third-party websites, and there is a slight possibility that some kind of advertisement promoting bad websites will be shown for users by mistake. Researchers at pcthreat.com have noticed that the majority of advertisements shown by this ad-supported application are in French, so you will be able to recognize some of them and thus could ignore them. Of course, this program will, most probably, show ads in English as well, which means that you will not recognize them all and thus might click on any of those ads belonging to Findizer unknowingly. Needless to say, there are many users who click on ads shown by adware accidentally. As you already know, this is quite dangerous, so it would be better that you get rid of Findizer and then find a more trustworthy program to install it instead of the adware. Some users download and install the adware program themselves; however, research has shown that the majority of people still say that they have not downloaded Findizer, which suggests that it usually finds another way to sneak onto the computer unnoticed. According to our specialists who have tested Findizer, it is very likely that this program comes bundled with other applications, usually freeware, which can be downloaded from the web easily. In most cases, users who often download software from untrustworthy third-party websites end up with Findizer, so people who do not want to encounter unreliable software should not download applications from questionable websites ever again. Users who are eager to protect their computers from harm should also install security software on their PCs. Findizer is not a very bad program but you still risk causing harm to your PC by keeping it installed. Therefore, we suggest eliminating it right now. As this piece of software is not an extremely dangerous computer infection, Internet Explorer users could delete it through Control Panel. In other words, they could stop the flow of commercial ads easily. In case you are a Mozilla Firefox or Google Chrome user, you will need to remove the extension of Findizer from these two browsers. Follow our step by step instructions you can find below or scan your PC with an automatic malware remover. Erase all other infections that might be hiding on your system as well! Delete the extension that belongs to Findizer. Select the undesirable extension and click on the recycle bin button. Quick & tested solution for Findizer removal.